Foundational document of the organization Galician Nationalist Bloc, which condenses ideological, political and organisational principles, approved during the first National Assembly. The evolution of events on the Spanish government's political reform stage at the end of the seventies and beginning of the eighties put Galician nationalism in a hostile environment, principally in the sector where the main political objective was democratic break-up. Before this critical situation, came an initiative directed at building a new project with a common front character to adapt itself to the new socio-political context through the integration of nationalism into a sole organization. This proposal was confirmed by a constituent process, in which political parties, groups and individual people could participate, which ended in September 1982 with the foundational Assembly of the Galician Nationalist Bloc. This manifest was debated and approved at this Assembly which worked as the BNG's basic statute until the middle of the nineties. 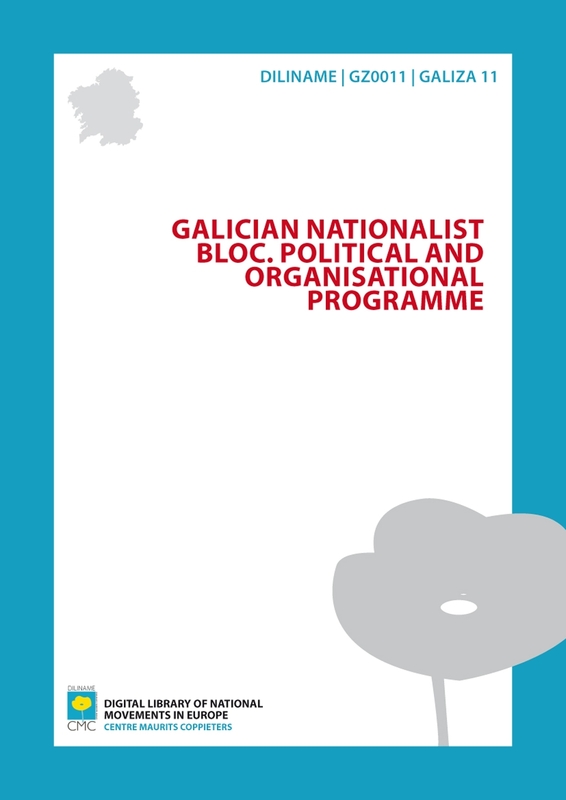 This document was condensed into the Galician Nationalist Bloc's ideological, political and organisational principles. The structure and even the contents of the foundational manifest tell of the nature of the constituent process which results in the convergence of different political projects. The manifest is made up by four parts, the first contextualizes the unitary alternative as a necessary and essential tool to achieve nationalist objectives; the second part strengthens the ideological-political principles that define the organization's main foundations, not only operationally but strategically, together with the founders' common principles, which at the same time, make up the organizational unit's sustenance; the third sets out BNG's immediate political objectives starting from the rejection of political reform started in 1975 and principally the Constitution and the autonomous framework. The last part of this document determines the basic organisational principles that will govern BNG's operation, highlighting its assembly-type character and political pluralism. All political forces, organisations, groups and people who undertake the formulation of a united alternative of nationalism, do so convinced that there are more criteria that unite us, in this historical period, than separate us. At the same time, we agree that an organic formulation of the necessary unity should be done respecting the ideological-political diversity that makes up real nationalism. Starting from this respect, unity is possible together with the existence of a defined and efficient area of militancy, however, for it to be a useful and positive tool for our people, it must be based on minimum points, but that are perfectly defined and are non-waivable, without which we would be setting up a political fraud. We are trying to make an Organisation which is as broad as possible and that will allow nationalism to penetrate into the social Galician network: for this we need open, democratic, participative structures, combining these with certain discipline and efficiency so as to make them effective. Give the nationalist trade union movement a sole union Centre that can control the processes aimed at overcoming the division of the Galician workers movement, in the previously mentioned way. To reinforce the social introduction of nationalism in farming and fishing sectors. Use the political route, which means correctly coordinating organisational work, mobilisation and struggle, population awareness, without leaving the barren areas from the institutions up to the electoral platforms, always concurring with the electoral processes as long as they serve as a tool for clarification and advance in national awareness. To combat political confusion through clarification, identification of the enemy and dangers that this country is going through, and to study the most advisable methods to defend the interests of the working classes and the national identity of Galicia. GALICIA IS A NATION and therefore it has the right to political self government, which so that it can be real, must be arranged from an alternative to National Sovereignty, a necessary framework to exert common control of Galician society's resources. Galician people consequently have the right to exercise their constitutional power that leads to complete National Sovereignty. DEMOCRACY: The democratic principle is as fundamental as inherent with regards to the people’s right to power, in conditions of equality and freedom that are real and not just official. ANTI-TRUST AND WORKING CLASS INTERESTS: Democratic policy must be steered towards defending the people’s interests and directed at abolishing monopolies. SELF-GOVERNMENT: We consider the principle of national self government as basic (Unions, parties, mass meetings...) to correctly defend the Galician Nation’s interests, rejecting all types of political colonialism from any ideological tendency. GALICIA AND COLONIALISM: Starting from the fact that Galicia is subjected to colonial dependency the political activity takes the route of breaking away from this dependency. ANTI-IMPERIALISM: For our policy, which is directed at achieving a free Galicia, the principle of militant anti-imperialism is the key, which is why the Organisation defines itself with international solidarity and supports all struggles from people in Spain and in the World who want to achieve their own national freedom. That is why, we are against the EEC and NATO because they are Organisations, on an economic and political-military level, that represent the interests of great monopolies and Western European and American Imperialism. WORLD PEACE AND DISARMAMENT: The Organisation defines itself by world peace and disarmament. Socio-economic development that is able to break the Galician economy’s colonial dependence and qualitatively change life and working conditions for the benefit of its entire people, giving them back their decison making powers on their resources and economical activities, to abolish unemployment and ensure a dignified standard of living in their own country with the recovery of its emigrants. Initiative and control of training policies and investment in financial resources, starting with Galician savings which today are misspent, badly invested or expatriated, as the key point in self-centred economic development, by the creation of Galician public financial institutions adapted to this. Control and nationalisation, in this case, of mining resources strategic to our economy and fundamental for the development of transformation processes used according to the needs and material progress of Galician society (of the Galician people). Socialisation of energy resources and nationalisation of their extraction and distribution. Development of agricultural and fishing sectors in the Galician economy, from the view of constant modernisation (improvement) and sensitive to its structures, through agricultural reform and fishing restructuring conducted with the active participation of farm workers and fishermen and based on their interests. Industrialisation of the country by combining the criteria of creating skilled jobs, productivity and social gains, creating a non-dependent, dynamic, diverse industrial sector able to exploit and rationally transform basic Galician resources. Design and carrying out of a specific economic policy for those sectors in crisis caused the economic strategy of the Spanish State and the international economic crisis. Urban reform and town planning, starting from the historic and current geographic status of our Country and based on social welfare. Setting up of a national health service, which is free to everybody. Education will be based on common interest and linked to Galicia's present position as well as being more secular, governmental and co-educational. Achieve the normalisation of Language and Culture, to succeed that in practice Galician is the language of Galicia. Galician nationalism is for the breakup of the actual political Regime because it represents explicit and aggressive denial of the previous principles and threatens fundamental freedom for people and Nations that make up the Spanish state. In this last respect, we will fight to achieve an amnesty for all nationalist, anti fascist and social prisoners, for real democracy of the administrative departments of the Spanish State, including police, law and army and we will defend democratic liberty and especially the freedom of expression. The Spanish constitution and the legal reflection of our refusal to accept national sovereignty, creates a social-economic capitalist order and also enables, a reduction in democratic freedom, reasons for which we do not accept it. In the autonomous framework there are no solutions to Galician problems, so they have to be overcome quantitively. Even an autonomy provided with everything that the Constitution allows, because of its nature is unable to resolve our problems, even if it works at its best. Our political actions, in the context formed by the Constitution and Autonomous region, will not legitimise them, and will worsen the existing contradictions; we will use initiatives to increase national and political awareness of our country and will improve living conditions together with the creation of objective conditions that will allow their development. Democratic behaviour is the only thing that is compatible with the objectives that are pursued, guaranteed at all levels: information, debate, decision taking and management. The Organisation, which aims to be plural, open and participative, will base its working dynamics and political decision on assembly decisions. The representatives will be subject to imperative mandate, and could therefore be revoked by the voters. Different political, ideological and support organisations at the heart of Galician nationalism are explicitly recognised, together with the different strategic processes that are to do with our national sovereignty. Therefore we recognise the existence of diverse political tendencies at the heart of the Organisation even though their subscription and political affiliation may be individual. The official position of the Organisation will be determined by a majority. The rights of minority positions to defend themselves publicly shall be guaranteed, legitimately disagreeing with the majority decision. The necessary debate that must be produced at the heart of Galician nationalism, leads us to defend freedom of expression not only for the different organised options but also individually for all its members. The right to publicly defend minority positions and to defend the freedom of expression becomes a reality with the right of public disagreement as long as in practice an operative contradiction does not arise that leads to a block or a boycott of a majority decision. The Organisation shall be structured on different territorial levels. An incompatible regional structure to its assembly nature is not considered.